Far far away in the mountains, absolutely no pollution, no phones, no internet, no electricity, not much rush or too many people around. It was serene bliss. I felt completely rejuvenated in spite of the intense trek for 4 days in a row. All I could think about at that time was my body thanking me for being away from all the pollution. I could feel my lungs breathing fresh clean air every minute. Waking up to the magnificent views I could ever imagine and fresh air made every day blissful. There were times when me and Nitin would wake up in the middle of the nights to stargaze. The mountains, the meadows, the rain, the clouds, the stream crossings, the cold weather, and the people around, it was like a Paradise! I used to look forward to drinking water from the streams even though I would not feel thirsty because of the taste and purity. We drank water directly from the streams and you could see and feel how tasty it was. It is very important to keep yourself well hydrated while trekking on high altitudes as your body runs out of oxygen very quickly, and it also helps you with altitude sickness. The time spent in Himalayas was spellbound. Every experience was enriching. We were a group of 14 people from different countries (India, London, Europe, USA). The time spent with all of them was a pleasure. We all became good pals during our 7 days of adventure. Staying away from gadgets and indulging in conversations with unknown people who are now good friends was exciting. As we finished our trek for the day and camped we all used to get together under one big dinning tent dined together. We played games, and chatted about random topics. I remember when we halted in between an intense trek and got under a camp tent to prepare Maggie (Ma-hi as pronounced by the Dutch) it was sub zero temperature at that altitude. That is one of my favorite pictures from our trek days. The river and the crossings when all of us held hands and crossed together and the moments when everyone was encouraging each other to complete the task giving them motivation and energy. Trek is like a team work and we were fortunate to be a part of an amazing group. The mornings were a bit weird, at least for me on the first day. To find a spot for nature calls amidst group of people in such open spaces was a funny task. You do not get to shower for 4-5 days, but that’s the beauty of trekking, it’s so raw and you wont feel grimy. We never encounter such problems in our daily lives. We had cooks and 2 mules who came along with us. The mules helped carry cooking essentials and backpacks of those could not carry them. I still remember the last day of our trek when we saw the sight of the road far far away from where we were after 4 days, no one wanted to walk ahead even a step, and we just sat down remembering our experiences from the past few days. Absolute BLISS ! We traveled to quite a few countries across different continents in the past, but Himalayas were the best, and I feel nothing and no country can beat them. 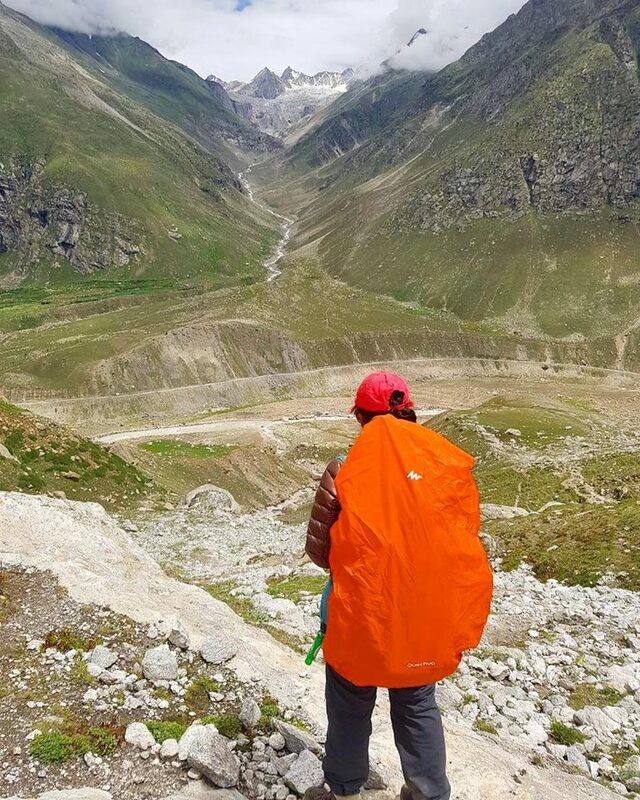 Trekking is not as easy as we think, especially in the mountains like Himalayan ranges. The day we reached Manali, our friend who organized our trek, took us for a small hike to a waterfall called Jogini waterfall. It set an expectation in our minds about how the rest of the trek was going to be and also what were the essentials on the trek. It was a good start to a major trek. Anyone planning a trek to Himalayas, I would recommend Jogini trek first so you would understand what you are going to experience the next few days. Jogini is a 2-3 hour trek to the waterfalls which is located within the Manali city. After our 4 day trek we visited the Key monastery which is a 1000-year old. We visited the 2nd highest inhabited village in the world, Kibber village in Spiti valley. I was astounded to see the life of families living there. I spoke to random people and they lived in that village from the time they were born and they do not know another world, they never visited even Manali. They have one bus which goes to places nearby and that’s their only transport system. One lady was generous enough to offer us fresh barley. They harvest their own crops depending on the season. I am still surprised to think how they live up in the mountains. Please find the detailed itinerary of our trek below. A jeep/ car will take you to Jobra where the trek begins. You trek along Hamta River towards north to reach at a beautiful place called Chhika. The area is speckled with wild flowers and there are a few waterfalls just behind the campsite. You halt here for overnight stay. The river takes a westward turn from here and so does the route. You leave behind the tree line. Beautiful mountain meadows welcome you on the either sides of the river. The path is paved by the grass and stones and field of the wild flowers. Today’s trek ends at Balu-ra-Ghera- a flat ground beside the river Hamta. The trekking on this day is challenging and the climb to the top of the pass (4270 mts) takes about three to four hours. From the pass one can enjoy the view of magnificent Himalayan peaks like DeoTibba, Indra Asan, Indra Kila. From the top of the pass there is one hour descend to the meadows of Shea Gohru. This is a beautiful campsite on the foot of the glacier. From here the trail descends down along the left bank of a mountain rivulet. After crossings the rivulet at two places you reach at Chhatru. Chhatru is a small roadside tourist destination on Manali-Spiti road on the bank of the Chandra river drive to Chandertal Lake in vehicle. Chandertal Lake is situated at an altitude of 4300 mts. at the source of river Chandra. On the way you cover places Chhota Dara, Bara Dara, and Batal. At the foot of the Kunzam Pass you take left turn along the river to reach at Chandertal Lake. Travel from Kaza to Pin Valley, the land of Ibex and Snow Leopards. Visit Kungri monastery at Pin Valley. Continue drive to Tabo. Visit Tabo monastery. Founded in 996 AD by the great teacher Richensang-po, Tabo is renowned for its breathtaking murals and stucco images – and is often called “The Ajanta of the Himalayas”. The largest monastic complex in Spiti, the old section has 9 temples, 23 chortens, a monks chamber and a nuns chamber. There are several caves adorned with frescoes and contemporary structures too. Dhankar gompa. This gompa rests high over the valley and is a stupendous example of local architecture. It is regarded to have once been a fort and was also the residence of the ruler of Spiti In trans Himalayan Buddhism, Tabo’s sanctity is next only to Tibet’s Tholing gompa. Overnight at guest house or Home stay. All Meals while trekking (Vegetarian FoodTented accommodation in alpine tents during trekking days: Twin/Triple sharing tents, sleeping bags, foam trekking mattresses, dining tent, and toilet tent.Qualified High Altitude Trekking Guide only for trekking.Trained High Altitude Field Staff.Transport as per itineraryPorters/Mules to carry personal luggage. (Personal luggage should not be more than 10kg)1 NGT kaza and 1 NGT- Tabo or Pin valley in Guest house or Home stay.All sight Seeing Mentioned in itinerary . Rucksack 55 litres. Make sure the rucksack comes with a rain cover to protect it. Two pairs of trekking pants. Not jeans or tracks pls, trekking pants have a lot of advantage, they dry quickly, are wind proof, and can hold a lot of stuff in its pockets. One pairs of thermal wear, to keep you warm, mainly when sleeping. Regular tracks and/or pajamas for sleeping. Under garments, make sure you get the ones which helps you not to get a scratch, as scratching is common especially during long treks. Two t shirts or one sweater. One thick down jacket which is water and wind proof. Two pairs of woollen socks and one pair of cotton socks. A pair of trekking boots and a pair of slippers/sandals. (I cant stress more on how important the trekking boots are! they are a little pricey but they will stay with you for a long time) consider getting good qiality once. One day hat and one night hat (skull cap). Your personal towel, and other toiletries. Moisturizer, sunscreen lotion with the highest SPF, goggles, and lip balm. One small Tiffin box, a spoon, and one water bottle. Trekking pole, helps a lot in minimising the strain on your body at least by 30%. One pair of water proof woollen gloves. Personal medication, and other preventive medication like Dolo, Zinctac, Eldopar, B-complex, and most important of all diamox. Powerbanks and cameras with backup batteries! Poncho to keep us dry during trekking if it rains. Please contact me for any further information regarding the trek.